Moreover, Zaga is powered with YT Framework v3 – our latest Joomla framework, K2 component and a wide range of functional extensions for the best website performance. Vistors will be attracted by the well-structured layout, the smooth navigation as well as the nice effects at first sight. Specially, YT Framework v3 is directly integrated in the template package. Therefore, you won’t need to install the single framework package for using. Let’s take a look at Zaga demo to get the real experience! Zaga has a unique design with a single vertical page using vertical scrolling. Each page is featured with particular extensions that highly attract viewers’ attention. The amazing homepage background video makes your website be more adorable. 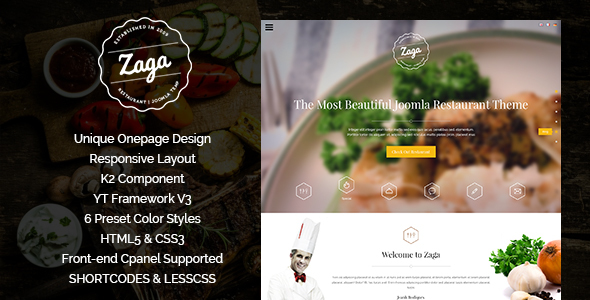 Zaga is powered by the latest Joomla template framework – YT FRAMEWORK V3, and flexible with Bootstrap3 at core. Therefore, the template comes with many useful shortcodes: video, gallery, slideshow, tab. You can totally manage your site without much coding knownledge. Zaga provides 6 available color presets: Oranges (default), Blue, Red, Green, Firebrick and Lavender which effectively make-up the website skin. By using Cpanel, you can easily take a preview look on each color. Zaga is built to be fully responsive and adaptive with various screen resolution and work well on any web browsers, any devices: mobile, iPhone, iPad and other tablets. Slidebar menu is a powerful menu for the onepage design template. With ourslidebar menu, you can whether to show or hide it just by only one click. Powered by K2 component, Zaga should be a great online solution for content management system. Along with Joomla! for articles, this template uses K2 as component to build blog with tags, comments and social sharing.With K2, your layout of listing page would be amazing with 1, 2, 3 columns. In the detail page, customer can quickly view the large image’s article as pop-up when click on image without leaving the current page. It’s great for you to have an event page which effectively show your all events with date, event name, brief description and detail link. Your customers can easily follow your restaurant’s events. Menu with ability to show delicous foods in each category with name, description and price. Furthermore, customers are able to request their favorite dishes via offered button. There’s a place that provides useful information for vistors. It not only allows visitors to book a table but also write review and send letter. That will bring customers closer to your restaurant as well as improve customer relationship effectively. Contact is integrated utility functions such as Address, Social Profiles, Google Map, Description, Send Mail. Support many extensions: SJ Basic News, Sj Carousel, Sj Content Accordion, SJ Module Tabs, SJ Contact Ajax, SJ K2 Extra Slider, SJ K2 Slider, SJ K2 Simple Tabs, YT Framework Plugin, YT Shortcodes Plugin, SJ Content Related News, K2 Component.